June 20, 2014 – The Children’s Medical Center Research Institute at UT Southwestern (CRI) has identified a biomarker that enables researchers to accurately characterize the properties and function of mesenchymal stem cells (MSCs) as they exist in the body. MSCs are the focus of nearly 200 active clinical trials registered with the U.S. National Institutes of Health, targeting conditions such as bone fractures, cartilage injury, degenerative disc disease and osteoarthritis. The finding, published in Cell Stem Cell, significantly advances the field of MSC biology, and if the same biomarker identified in CRI’s studies with mice works in humans, the outlook for clinical trials that use MSCs will be improved by the ability to better identify and characterize the relevant cells. 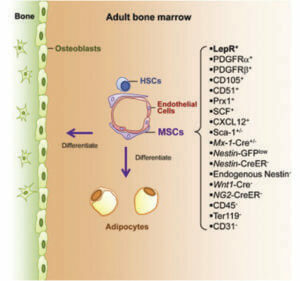 In the course of their investigation, the CRI researchers found that Leptin Receptor-positive MSCs are also the main source of factors that promote the maintenance of blood-forming stem cells in the bone marrow. Dr. Bo Zhou, a Leukemia & Lymphoma Society Fellow in Dr. Morrison’s laboratory, was first author of the paper. Other CRI researchers involved in the study were Dr. Rui Yue, a Damon Runyon Fellow, and Dr. Malea Murphy, a postdoctoral research fellow. The project was supported by the National Heart, Lung and Blood Institute, the Cancer Prevention and Research Institute of Texas, and donors to the Children’s Medical Center Foundation.